Aquinas on Truth is drawn from Chapter Seven, beginning on page 199, of Volume Seven, A Glorious Disaster of the twelve-volume historical series The Christians: Their First Two Thousand Years. If you would like to order this book please visit www.TheChristians.info. Professor X teaches biology at a top-ranked American university and worships devoutly at a local church. How does he reconcile his scientific beliefs with his religious ones? “Very simply,” he would explain. “Scientific truths are one thing, Christian truths quite different things.” Yet Thomas Aquinas would say that Professor X is wrong. There cannot be two truths, he insisted, but only one–though finite human minds can never knit that infinite truth into a single formula. Professor X is fictitious, but his position–that there is more than one kind of truth–is not fictitious at all. It has been held by many Christians, not all of them scientists. However, in the thirteenth century Christians found themselves particularly divided, with some advocating a distinction between scientific truth and religious truth, others holding that only divine revelation can disclose what’s true. 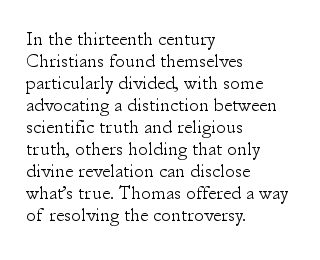 Thomas offered a way of resolving the controversy. He united what we can learn from thought (i.e., reason) with what God has revealed to us directly (i.e., revelation). But they must both be considered truth, he said, because there can be only one truth. Yet even in Boethius’s day, it had been a departure from the human norm. Nearly all civilizations have implicitly divided themselves into “two truths”–with the learned holding an elite philosophy and everyone else a folk myth. But Christians have tended to resist this division. If God created the material world and nature “proclaims his glory,” they say, then Christianity should nurture science. While physical science must progress by its own rules, they regard dogmatically atheistic science as unscientific. It has moved out of the scientific field into the theological to voice a plainly unscientific antagonism toward faith. What raised the issue in the thirteenth century was the rediscovery in the West of Aristotle’s “natural philosophy.” In the fourth century BC, the great philosopher had developed a philosophy of nature, based on the reproduction of species: trees reproducing trees, dogs reproducing dogs, and rational human beings reproducing rational humans. All these, he said, expressed the “logos,” or “reason,” of nature. This eternal logos of the material world, he concluded, requires that there exist an eternal Mind, or Divine Reason. Though not the loving Creator of later Christian revelation, here lay that which was ultimately responsible for the order, beauty, and permanence of nature. However, Aristotle’s teaching reached the West via Muslim philosopher Ibn Rushd–latinized into “Averroes”– who had died about a quarter century before Thomas was born. To Averroes, divine revelation was merely a poetic popularization of natural reason. True human bliss lay in philosophic contemplation, but this was reserved for the wise. The populace needs myths like personal immortality, heaven, and hell to make them live moral lives in decent societies. So religion is simply the poetic expression of abstract philosophic truths. Theologians must learn from philosophers the truths of nature and translate them into divine myths–but otherwise leave philosophers alone in their contemplation. When western followers of Averroes made the same claims for natural science within Christendom, the knee-jerk reaction of many Christians was to ban Aristotle altogether. After all, had not the great Augustine himself stressed the total dependence of creation on its Creator? But Thomas realized that God has granted creation a qualified independence, governed by natural laws and discoverable by natural reason. He saw that when focused within the limits of nature, Aristotle’s natural philosophy could become a most useful tool. Even so, many theologians resisted Thomas’s effort to “baptize” Aristotle, lest science come to erode the authority of revelation. To them, it didn’t matter what a man thinks about creation, so long as he has the correct opinion about God. But Thomas objected. An error about creation ends as false thinking about God, he maintained, because there can only be one truth. Eventually, his teaching prevailed and Thomas thus endowed western civilization with a solid faith in the intelligibility and benignity of the natural order, the cultural precondition out of which natural science arose in the western world. All rights for this article on Aquinas on Truth are owned by the Society to Record and Explore Christian History (SEARCH). In accessing this page on Aquinas on Truth you agree to only download the content for your own personal non-commercial use.